Pentecost comes in the early summer (mid May-mid June). It’s the only Levitical Feast Day between the three spring feasts (Passover, Unleavened Bread, and First Fruits) and the three in the fall (Rosh Hashanna, Yom Kippur, and Tabernacles). The Hebrew name for this Day is Shavuot, which means weeks, so in Israel, it’s often called the Feast of Weeks. This is because it’s supposed to occur seven weeks after the Feast of First Fruits (Lev. 23:15-16). Deut. 16:9 confirms this. “Count off seven weeks from the time you begin to put the sickle to the standing grain.” The first cutting of the grain took place on the Feast of First Fruits. Since First Fruits was the first day after the Sabbath that follows Passover, it was always observed on a Sunday. Shavuot, being seven weeks later, was always on a Sunday, too, and celebrated the beginning of the summer harvest. But in 140 AD, following the final defeat of the Jewish nation after the bar Kochba revolt of 135 AD, the Sanhedrin changed the focus of Shavuot from the summer harvest to the giving of the Law. They did this because Shavuot was one of the three feasts all Jews were required to observe (Exodus 23:14-17 tells us Unleavened Bread and Tabernacles were the other two) and the defeated and dispersed nation would no longer have any national harvests to celebrate. From that time on, the countdown began from the first day of the Feast of Unleavened Bread, the day the Israelites left Egypt. So now Shavuot can come any day of the week and takes place on the 6th day of the Hebrew month called Sivan, which is the traditional day Moses received the Law from the Lord. Making this change placed the giving of the Law at Mt. Sinai exactly seven weeks after the Exodus from Egypt and preserved the Feast of Weeks in Jewish life. 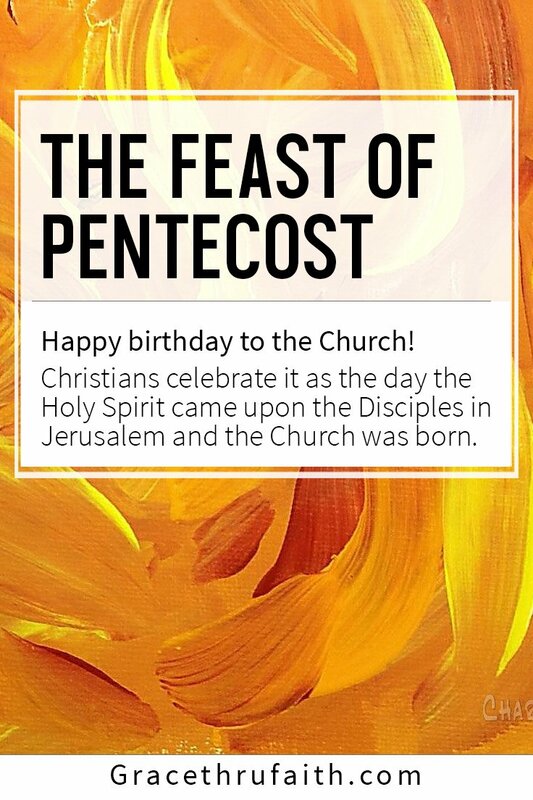 Christians call this day by its Greek name, Pentecost. Pentecost comes from a word that means “50 days.” That’s because there were 50 days from the Sabbath that followed Passover to Shavuot (Pentecost). Early Christians also changed the way the various dates are determined, although we’ve retained the Sunday requirement for Pentecost. Christians now start counting on the day we call Easter Sunday, which is officially the first Sunday after the first full moon that follows the Spring Equinox. We count Easter Sunday as day one, so Pentecost is always 49 days after Easter and always comes on a Sunday. By counting Easter Sunday on both ends of the span, we can arrive at 50 days (Pentecost) and still keep the celebration on the 7th Sunday after Easter. Acts 2 describes that day for us. On Pentecost, the followers of Jesus were all gathered together in one place when a sound like the blowing of a violent wind filled the house where they were staying and what seemed like tongues of fire separated and came to rest on each of them. They were filled with the Holy Spirit and began to speak in other languages as He enabled them. Just before He ascended into heaven Jesus told them to expect this (Acts 1:8) and now it was happening. Since Pentecost was one of the feasts where attendance in Jerusalem was required, there were God-fearing Jews from many other countries in Jerusalem, swelling its normal population substantially. The sound of the wind had alerted those who were nearby and as they came closer to see what it was, each one of these pilgrims was amazed to hear the disciples, who were all Galilean, speaking in his own language. Peter got their attention and explained what was going on. It was the first public presentation of the gospel since the Lord’s death and resurrection, and when Peter had finished, 3,000 of those gathered around had accepted his message and were baptized, and the Lord continued adding to their number daily. If you agree with my view that the parables of Matthew 13 describe the Kingdom of Heaven on Earth and that the parable of the yeast (Matt. 13:33) predicts how the Church will be filled with sinners, you’ll be interested in the fact that unlike all the other Levitical Feasts that call for unleavened bread (no yeast), Pentecost calls for two loaves of bread baked with yeast (Lev. 23:17). In the Bible leaven, or yeast, is a model of sin because it causes the dough to begin spoiling. Other Jewish Pentecost ceremonies also reveal a subtle hint of the coming Church. In synagogues, the Book of Ruth is read on Pentecost. The story of Ruth has been called “The Romance of Redemption.” It’s about Naomi, a Jewish woman from Bethlehem who lost her land due to a famine in Israel and was forced to flee into neighboring Moab (Jordan), where there was no famine. Shortly thereafter her husband passed away leaving her penniless and alone in a foreign country. After the famine had ended, she returned to Bethlehem accompanied by Ruth, a gentile woman who had sworn never to leave her. Ruth was a Moabite who had married one of Naomi’s sons (who also died) making her Naomi’s daughter-in-law and a destitute widow as well. Once back in Bethlehem Naomi’s close relative, a prominent Jewish man named Boaz fell in love with Ruth and married her. In the process he also regained Naomi’s land as her kinsman-redeemer. Both these events were accomplished according to the Law. For Naomi it was the law of redemption (Lev 25:25), and for Ruth it was the law of leverite marriage (Deut. 25:5-6). The modeling here is dramatic, with Naomi in the role of Israel, destitute and alone, Ruth as the Church, the gentile bride, Boaz as the Messiah, and the story itself as a prediction of the relationship that would involve all three of them. In the process of redeeming Israel, the Messiah takes a gentile bride. In doing so, He saves both from their destitute condition and restores Israel’s Land. The identification of the Church with Pentecost began in the prophecies of Ruth. To learn more about these incredible prophecies, and enjoy one of the world’s classic love stories, read Ruth’s Story. By the way, Boaz was the son of Rahab, the harlot from the Book of Joshua (read “The Gospel in Joshua … The Story of Rahab” ). His great-grandson David became the King of Israel. Rahab and Ruth are both listed in the genealogy of the Lord Jesus (Matt. 1:5), and King Solomon named one of the pillars at the entrance to the Temple after his ancestor Boaz. By tradition, Enoch, one of the patriarchs from Genesis 5, was born on the day later to be known as Pentecost. Enoch’s name means “teaching,” a primary function of the Church (Matt. 28:19-20). For this reason many scholars see him as a “type” of the church as well. Genesis 5:21-23 indicates that Enoch had a close relationship with God and was actually taken live (raptured) into Heaven before the Great Flood. Pre-Trib scholars see this event as one of several Old Testament hints that the Church will disappear from Earth before the Great Tribulation. These same traditions also hold that Enoch was taken on his birthday. So here’s a man, identified with the Church, perhaps being born and raptured on the day that would become Pentecost, the day the Church was born. Will the Church be raptured on our birthday, too? Personally I don’t believe the Rapture of the Church will be the prophetic fulfillment of any of Israel’s Holy Days. But if I’m wrong and the Rapture does fulfill a Levitical Feast, Pentecost seems to be the most obvious candidate. As you probably know, I believe the reason no one on Earth can accurately predict the day of the Rapture is because it’s a number specific event, not a date specific one. In Romans 11:25 Paul implied the church has a “full number,” when its ranks will be considered complete. When that number is reached the Church will “come in,” which means it will arrive at its scheduled destination, like when a ship “comes in.” Jesus said the destination of the Church is His Father’s house (John 14:2). Put it together, and I believe it means we’ll be raptured as soon as the predetermined number of Christians has been born again, no matter what day it happens to be. No matter what day it happens to be, one day soon now, all who are in Christ, having heard and believed the Word of Truth, the Gospel of our salvation (thereby receiving the seal of the promised Holy Spirit) will suddenly disappear from the face of the Earth along with all children and others who are intellectually incapable of making informed choices about their eternal destiny. In one instant we will have been going about our daily routines here on Earth and in the next we’ll be standing in the presence of our Redeemer, our sins forgiven and forgotten, and all our imperfections gone. Among us will be all the faithful dead of the Church Age, reunited with perfected bodies and restored to eternal physical life. Together we will begin the most incredible journey of exploration and realization ever dreamed of, and it will last forever. As it is written: No eye has seen, no ear has heard, no mind has conceived what God has prepared for those who love Him – but God has revealed it to us by His Spirit (1 Cor. 2:9-10). You can almost hear the footsteps of the Messiah. 05-23-15.